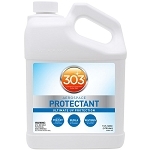 303® Fabric Guard keeps fabrics fresh, soft, colorful and breathableÉall while adding a powerful coating to repel water and prevent the most serious of stains. 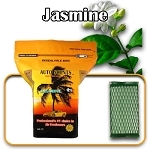 Use it to keep rugs clean, leather interiors fresh and covers blemish-free. You can even spray it on your convertible topÕs seams to prevent wicking. When applied to clean and dry fabrics, 303® Fabric Guard restores lost water and stain repellency to straight-from-the-factory levels. Keep all your favorite fabrics crisp and clean for years to come. Product liquid and spray are flammable, keep product and treated article (until dry) away from heat, sparks or open flames. Do not smoke when applying 303® Fabric Guardª. Spray until evenly wet, overlapping sprayed areas. NOTE: Reduced coverage when applied with paint roller or brush. Apply to fabric above 70¡F/21¡C. (For quicker drying/curing and best results, apply in full sun.) Treated material must be protected from rain/dew until completely cured. CURING: 12-24 hours dependent on temperature. If these steps are performed correctly, the material will be water repellent at this point. 303® Fabric Guard will need reapplication depending on fabric exposure to sunlight and weather conditions; pour water on fabric to determine need to retreat fabric. COVERAGE: 40-75 sq. ft. (30 x 60cm) depending on material and application method.? Cushions are stained and water soaks into the fabric..
Water and soil repel from the fabric, prolonging its life. The umbrella is stained from outdoor elements and rain. 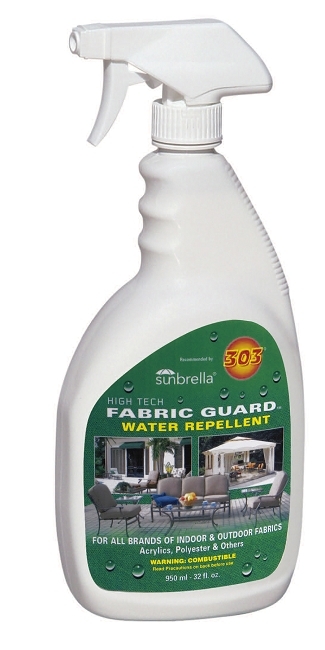 Water and soil repel from the fabric and it is protected from outdoor elements.